Don’t let watermelon season pass you by! 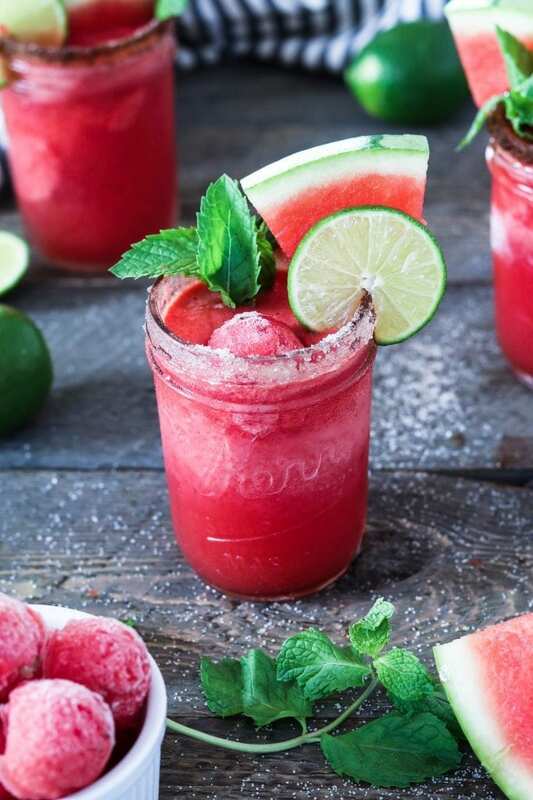 Treat yourself to this refreshingly tasty Frozen Watermelon Margarita. Happy Friday, friends! 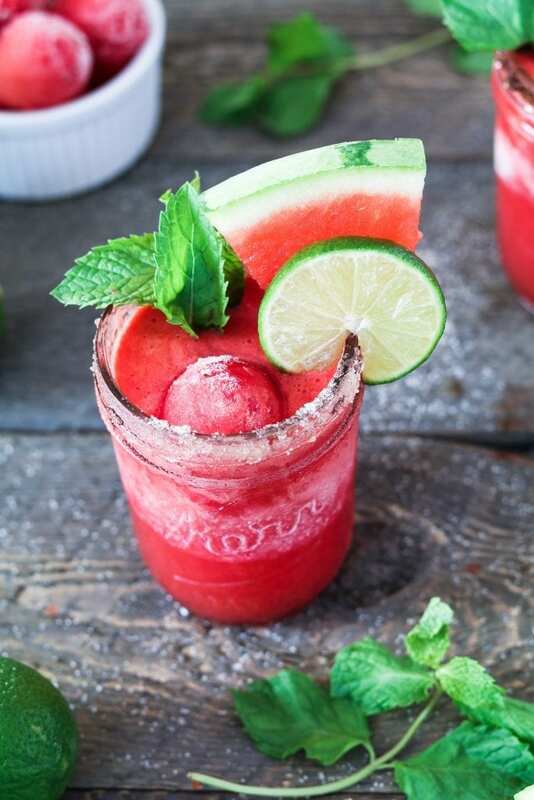 It’s certainly the perfect day to share this Frozen Watermelon Margarita recipe. I’m sure it’s happy hour somewhere about now, so it’s time to celebrate the weekend ahead. Shall we? A few weeks ago, I posted a photo of juicy fresh limes on Facebook that our lime tree gifted us. We planted the tree about 4 1/2 years ago and this is the first time we’re seeing SOO many limes. I use citrus in many recipes because it really brightens up a dish, so I froze some in ice cube trays (a great suggestion from a reader). I gave some to my neighbors, but we were still overflowing, so I’ve been making lots of citrusy recipes like my Avocado Cilantro Lime Dressing and these Coconut Lime Popsicles. 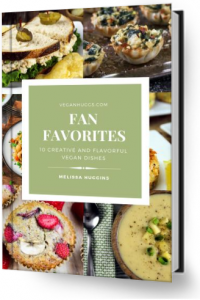 I needed a few more recipe ideas, so I thought it would be fun to ask the Vegan Huggs readers what they wanted me to make. I received so many great recipe ideas, and I plan to make as many as I can, but I quickly noticed the most popular suggestions were for an adult cocktail. How could I say no to this? Something needed to be done and I decided to make a Frozen Watermelon Margarita with fresh lime juice to save the day! I love making cocktails with fresh ingredients. I stay clear of simple syrup, and that syrupy lime juice concentrate. It just ruins the drink in my opinion and makes you feel like crap. Hangover city! So what’s more refreshing than fresh watermelon? It’s the most hydrating fruit out there and it’s perfect for this summertime heat. Sure, it’s wonderful all on its own, but freeze it up and add some quality tequila, and it gets even better. You can rim the glass with salt, sugar or a blend of chili powder and salt. This is completely optional but adds a little extra something to your cocktail. Garnish with fresh watermelon, fresh mint leaves and top it with a frozen watermelon cube. So, are you ready to celebrate? Let’s do this! 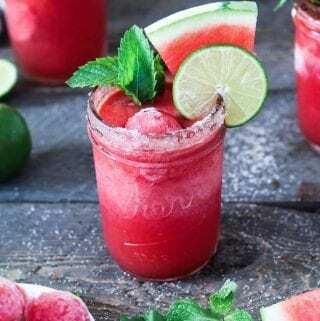 If you make this Frozen Watermelon Margarita, I’d love to hear what you think in the comment section below. It would really make my day. You can also follow me on Instagram and share your creation with me. Just tag me @veganhuggs and hashtag #veganhuggs so I don’t miss it. Don't let watermelon season pass you by! 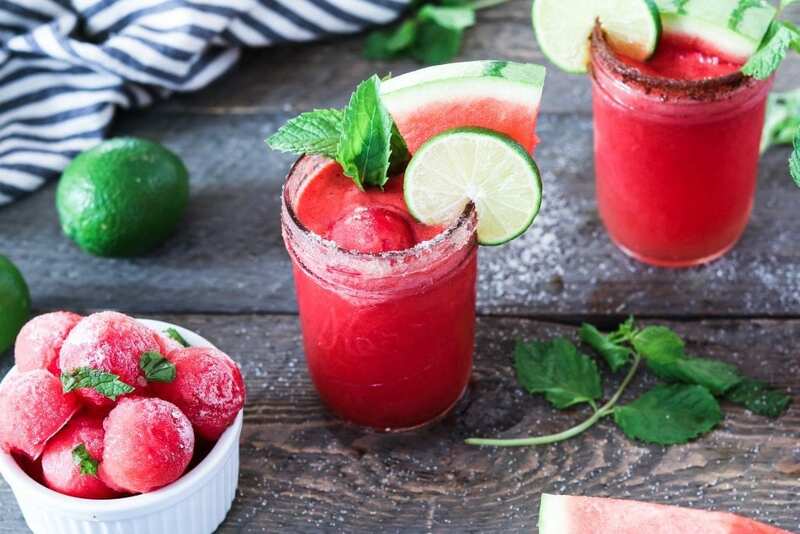 Treat yourself to this refreshingly tasty Frozen Watermelon Margarita. Place watermelon pieces on a non-stick baking tray (make sure it fits in your freezer). I lined it with wax paper for easy cleanup. Place pieces about 1" apart so they don't stick together. Freeze for 3-4 hours. When you are ready to make the cocktails, place drinking glasses in the freezer to chill. 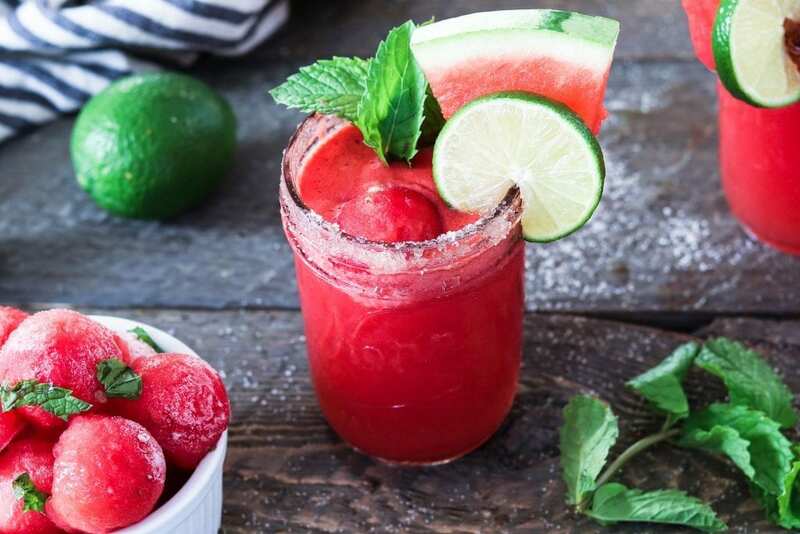 Place your watermelon, ice, tequila, orange liqueur, lime juice and agave into a high-speed blender. Blend until smooth. If your blender is stuck, you can move everything around a bit with a tamper or spoon (while turned off). You can also add a few splashes of water to help keep things moving. You can even use a few pieces of fresh watermelon. Taste the mixture and add more lime, agave or tequila if needed. If the mixture is too thin, add a few more pieces of frozen watermelon or ice and blend. Spread a bit of salt or sugar on a small plate. You can also mix equal parts chili powder & salt together to add a little kick. Rub each chilled glass with a lime wedge. Dip the rim into the salt at a 45-degree angle and turn gently, until glass is coated (this avoids too much salt going into the glass). Pour the frozen mixture into each glass, being careful not to disturb the prepared rim. Fill about 3/4 of the way. Garnish with a piece of fresh watermelon, lime wedge and a sprig of mint. You can also place a piece of frozen watermelon on top for fun. CHEERS! * Instead of making cubes you can use a melon baller or a measuring spoon to make watermelon balls (this is what I did). With this method, you don't need to remove the rind. Just cut the watermelon in half and scoop pieces out. * If you're not making the drinks right away, place the frozen cubes in a Ziploc bag to keep them fresh. * The nutritional information is calculated without the salted/sugared rim. * If you'd like to make mocktails, just omit the tequila and orange liqueur. Replace with coconut water.